Roosevelt had served as president from 1901 to 1909, and Taft had won the 1908 Republican presidential nomination with Roosevelt's support. Displeased with Taft's actions as president, Roosevelt challenged Taft at the 1912 Republican National Convention. After Taft and his conservative allies narrowly prevailed at the Republican convention, Roosevelt rallied his progressive supporters and launched a third party bid. Roosevelt's Progressive Party was nicknamed the Bull Moose Party after journalists quoted Roosevelt saying that he was "feeling like a bull moose" on the campaign trail shortly after the new party was formed. Backed by William Jennings Bryan and other progressives, Wilson won the Democratic Party's presidential nomination on the 46th ballot, defeating Speaker of the House Champ Clark and several other candidates. Meanwhile, the Socialist Party renominated its perennial standard-bearer, Eugene V. Debs. The election of 1912 was bitterly contested by three individuals, Wilson, Roosevelt, and Taft, who all had or would serve as president. Roosevelt's " New Nationalism" platform called for social insurance programs, an eight-hour workday, and a strong federal role in regulating the economy. Wilson's " New Freedom" platform called for tariff reform, banking reform, and a new antitrust law. Knowing that he had little chance of victory, Taft conducted a subdued campaign based on his own platform of "progressive conservatism." 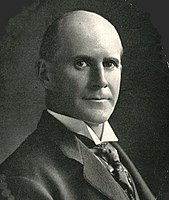 Debs claimed that the other three candidates were largely financed by trusts and tried to galvanize support behind his socialist policies. For the first time, significant numbers of delegates to the national conventions were elected in presidential preference primaries. Primary elections were advocated by the progressive faction of the Republican Party, which wanted to break the control of political parties by bosses. Altogether, twelve states held Republican primaries. 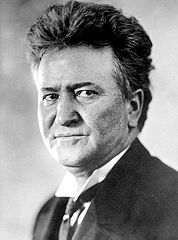 Robert M. La Follette won two of the first four primaries (North Dakota and Wisconsin). 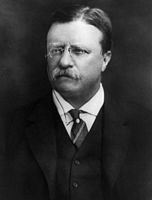 Beginning with his runaway victory in Illinois on April 9, however, Roosevelt won nine of the last ten presidential primaries (in order, Illinois, Pennsylvania, Nebraska, Oregon, Maryland, California, Ohio, New Jersey, and South Dakota), losing only Massachusetts to Taft. As a sign of his great popularity, Roosevelt even carried Taft's home state of Ohio. The Republican Convention was held in Chicago from June 18 to 22. Taft, however, had begun to gather delegates earlier, and the delegates chosen in the primaries were a minority. Taft had the support of the bulk of the party organizations in the Southern states. 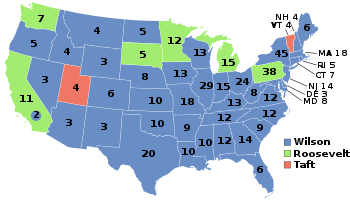 These states had voted solidly Democratic in every presidential election since 1880, and Roosevelt objected that they were given one-quarter of the delegates when they would contribute nothing to a Republican victory (as it turned out, delegates from the former Confederate states supported Taft by a 5 to 1 margin). When the convention gathered, Roosevelt challenged the credentials of nearly half of the delegates. [ citation needed] By that time, however, it was too late. 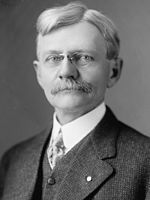 The delegates chose Elihu Root — once Roosevelt's top ally — to serve as chairman of the convention. Afterwards, the delegates seated Taft delegations in Alabama, Arizona, and California on tight votes of 597-472, 564-497, and 542-529, respectively. After losing California, where Roosevelt had won the primary, the progressive delegates gave up hope. They voted "present" on most succeeding roll calls. Not since the 1872 election had there been a major schism in the Republican party. Now, with the Democrats holding about 45% of the national vote, any schism would be fatal. Roosevelt's only hope at the convention was to form a "stop-Taft" alliance with La Follette, but Roosevelt had alienated La Follette, and the alliance could not form. The party was funded by publisher Frank Munsey and its executive secretary George Walbridge Perkins, an employee of banker J. P. Morgan and International Harvester. Perkins blocked an anti-trust plank, shocking reformers who thought of Roosevelt as a true trust-buster. 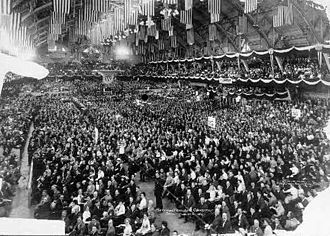 The delegates to the convention sang the hymn " Onward, Christian Soldiers" as their anthem. In a famous acceptance speech, Roosevelt compared the coming presidential campaign to the Battle of Armageddon and stated that the Progressives were going to "battle for the LORD." However, many of the nation's newspapers, which tended to be pro-Republican, harshly depicted Roosevelt as an egotist who was only running for president to spoil Taft's chances and feed his vanity. The Democratic Convention was held in Baltimore, Maryland, from June 25 to July 2. It proved to be one of the more memorable presidential conventions of the twentieth century. 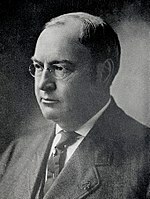 Initially, the frontrunner appeared to be Champ Clark of Missouri, the Speaker of the House, and Clark did receive the largest number of delegate votes early in the balloting. However, he was unable to get the two-thirds majority required to win the nomination. His chances were hurt when Tammany Hall, the powerful and corrupt Democratic political machine in New York City, threw its support behind Clark. 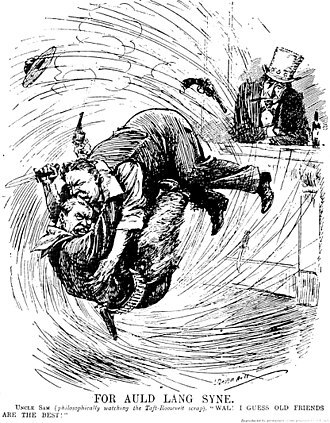 Instead of helping him, this led William Jennings Bryan, the three-time Democratic presidential candidate and still the leader of the party's progressives, to turn against Clark as the candidate of " Wall Street". 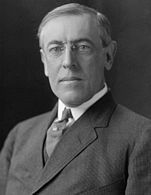 Bryan instead threw his support to New Jersey Governor Woodrow Wilson, who had consistently finished second to Clark on each ballot, and who was regarded as a moderate reformer. Wilson had nearly given up hope that he could be nominated, and he was on the verge of having a concession speech read for him at the convention that would free his delegates to vote for someone else. 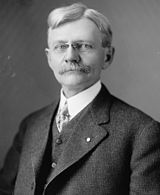 Bryan's defection from Clark to Wilson led many other delegates to do the same, and Wilson gradually gained strength while Clark's support dwindled. Wilson finally received the nomination on the 46th ballot. Both Taft and Democratic nominee Woodrow Wilson suspended their own campaigning until Roosevelt recovered and resumed his. When asked if the shooting would affect his election campaign, he said to the reporter "I'm fit as a bull moose", which inspired the party's emblem. He spent two weeks recuperating before returning to the campaign trail. Wilson's vote, 6,296,919, was less than William Jennings Bryan totaled in any one of his campaigns, and over 100,000 less than Bryan received in 1908, when Bryan won only 162 electoral votes. Wilson fell behind Bryan's results in most of the country, and notably so in Pennsylvania, Ohio, Indiana, Illinois, Michigan, Nebraska, Kansas, South Carolina, Kentucky, and Arkansas. In only two sections was Wilson's vote greater than the greatest Bryan vote: New England and the Pacific. Wilson led the poll in 1,969 counties, but he received a majority of the vote in only 1,237 counties, less than Bryan had had in any of his campaigns. 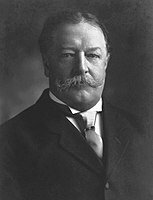 Taft had a majority in only 35, and "Other(s)" in only 305. These small figures clearly reveal the result of the division of the normal Republican vote, as does the fact that in a plurality of counties (1,396) no candidate obtained a majority. Taft had a lead over the field in only 232 counties. In addition to South Dakota and California, where there was no Taft ticket, and seven " Solid South" states in which he carried no county, Taft also carried no counties in Maine, New Jersey, Minnesota, Nevada and Arizona. Nine counties did not record any votes due to either black disenfranchisement or being inhabited only by Native Americans who would not gain full citizenship for twelve more years. The 772 counties not carried by Wilson or by Taft were distributed in 38 states, most of them in Pennsylvania (48), Illinois (33), Michigan (68), Minnesota (75), Iowa (49), South Dakota (54), Nebraska (32), Kansas (51), Washington (38), and California (44), and almost without exception were carried by Roosevelt. 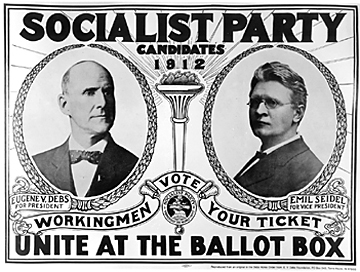 Debs carried four counties in Minnesota ( Lake and Beltrami), North Dakota ( Burke County), and Kansas ( Crawford County), the only counties ever to vote socialist in a presidential election. ^ "History, Travel, Arts, Science, People, Places | Smithsonian". Smithsonianmag.com. Retrieved 2016-08-18.